This new quilt measures 51″ x 63″ when completed. This is a current 4 week class that is perfect for a beginner . 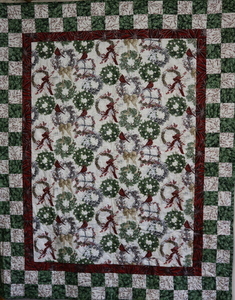 This quilt can be put together very easily and will be ready to enjoy this winter. The fabrics are from our newest Christmas/Holiday line of fabrics that just arrived. The cardinals in this beautiful fabric are vibrant and striking.